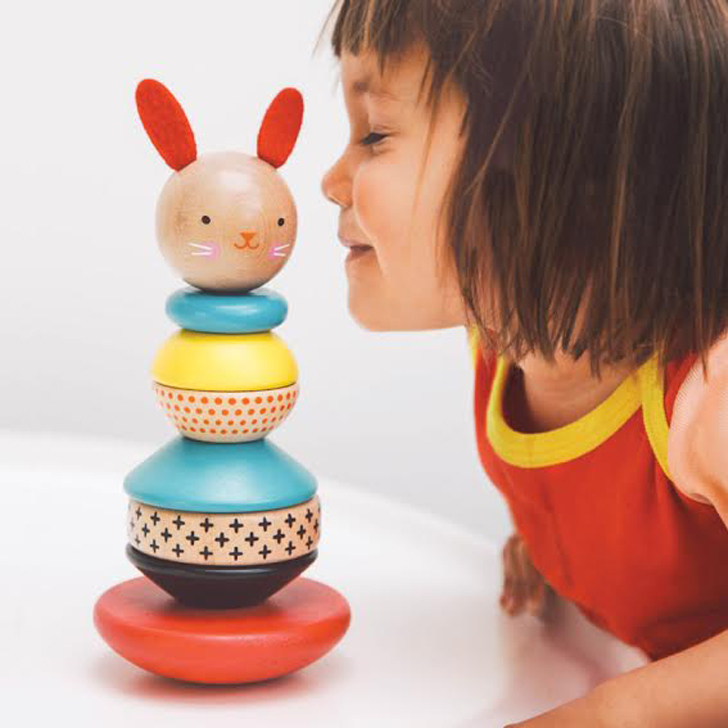 Petit Collage has hit it out of the park again with their adorable new Modern Bunny wooden stacking toy. Babies ages 6 months and up will hop to this colorful and contemporary take on the classic stacker. Made from sustainably harvested wood and featuring water-based, screenprinted designs with a non-toxic water-based finish, a smooth rounded base offers an added element of play, providing a slight swaying movement. The bunny can be built atop the post in any order little ones’ desire… and the cute critter is topped off with soft, wool felt ears! What a delightful gift this would make for the little bunnies in your life — and it could live on long after the munchkin stage as cheery decor. Petit Collage has hit it out of the park again with their adorable new Modern Bunny wooden stacking toy. Babies ages 6 months and up will hop to this colorful and contemporary take on the classic stacker. Made from sustainably harvested wood and featuring water-based, screenprinted designs with a non-toxic water-based finish, a smooth rounded base offers an added element of play, providing a slight swaying movement. The bunny can be built atop the post in any order little ones' desire... and the cute critter is topped off with soft, wool felt ears! What a delightful gift this would make for the little bunnies in your life -- and it could live on long after the munchkin stage as cheery decor.